WHAT IS CAPACITY, AND WHY DOES IT MATTER? - Matlin Law Group, P.C. Mom is 78 years old, living alone after the death of Dad. She was recently diagnosed with the early stages of Alzheimer’s. Mom doesn’t have a will, or powers of attorney for health care or property, and you have heard that these are important. You have also heard that if Mom lacks mental capacity, she can’t sign these crucial estate planning documents. Every adult in Illinois is presumed to have the capacity to make their own health care decisions, assuming they are in a conscious state. 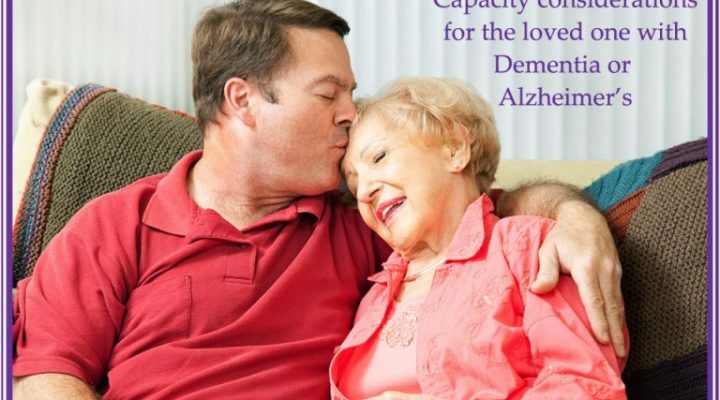 A diagnosis of early Alzheimer’s will not necessarily overcome this presumption, but a diagnosis of advanced dementia or Alzheimer’s could. The ability to make a disposition of his property in accordance with some plan formed in her mind. It is not necessary that the person actually knows these things. It is necessary only that she have the mental ability to know them. Neither Illinois statutes nor Illinois case law clearly establish the level of capacity needed to execute a trust. The key is determining whether the trust in question is more like a will or more like a contract. An irrevocable trust (such as a special needs trust or a life insurance trust) is more like a contract or deed than a will, because it disposes of the person’s property immediately and forever. A trust that delays making a gift to another person until after the client dies is more like a will, and requires a level of capacity similar to that required to make one. An irrevocable trust requires a level of capacity similar to that for a contract, as discussed below. The requirements to execute a contract or deed are the highest on the capacity spectrum. The person must have sufficient mind and memory to comprehend the nature and effect of her actions, to exercise her own will, cope with her adversaries, and to protect her interests. If Mom lacks the capacity to sign a will, then any will which she signs during her incapacity will be subject to legal challenge. For example, a contested estate matter could revolve around the issue of whether a person lacked capacity to favor one child over another or to give her estate to her hairdresser. If Mom lacks even the capacity to sign a power of attorney for health care, then you may have no option other than having her declared a disabled person, and appointing a guardian to act on her behalf. Guardianship requires filing a petition with the court to have a guardian appointed to handle the day to day financial and/or health decisions for a disabled person who is not able to fully manage her affairs. Guardianship can be avoided if the incapacitated person has signed valid powers of attorney for health care and property. Individuals who have been declared to be disabled may still have testamentary capacity that may be exercised with court approval. If you are in doubt about a relative’s mental capacity, you should have an assessment made by a qualified physician, (preferably a geriatric psychiatrist, or geriatrician in the case of an elderly person). If you have a family member whose capacity is diminishing, don’t delay in taking action to get his/her affairs in order. Encourage your family member to contact an attorney to put estate planning documents in place. Since capacity usually diminishes over time, it is important to take care of these issues as early as possible before capacity is lost.